Warning: This review contains overwrought prose/purple prose. 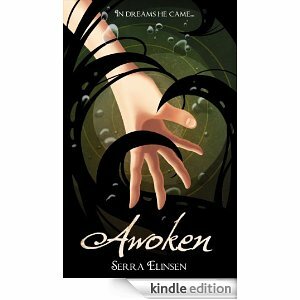 The writing style is apt, matching the precise vividness of Serra Elinsen’s eye for detail. Serra Elinsen has set all our hearts aflame and aflutter with one of the most romantic, poignant pieces of literature ever since William Faulkner confused, but positively dazzled everyone with The Sound and the Fury. Just as that masterpiece was William Faulkner’s magnum opus, Serra Elinsen’s brilliant expose of the nuances of new-found love and instantaneous romance is her own magnum opus, and deserves literary accolades of all types. How is this story different from Twilight? It takes Stephenie Meyer’s own purple prose, stilted dialogue to the next level; it makes purple prose that would have made Ernest Hemmingway shoot himself at the sight of the wholly complicated overuse of such powerfully dynamic adjectives. Shakespeare might have sighed dramatically, and drowned himself Ophelia style at by beholding Riley’s preciously prosaic Shakespearean speech. The level of detail in the prose renders such a rich image in our heads that I felt my brain oozing in a viscous liquid that might have radiated like toxic ooze and inadvertently created the Teenage Mutant Ninja Turtles, if someone were to crack my skull open with this heavy tome. I apologize for not conducting any research for this review or carefully moderating my speech. Serra Elinsen’s prose is written in free-form; it is a stream of conscious purple-prose that would put Virginia Woolf to shame. The overcooked sentences are reminiscent of Sylvia Plath’s poetry that portentously speaks of death by an oven. If Adromeda Slate does not have any gloriously hot man to fall deeply ad irrevocably in love with him, she would meet the same fate as Sylvia Plath, all due to her own self-abasing ways. The only difference is that Andromeda Slate has more insipid reasons, which will confuse any snobbish readers. Yet readers of superficial, yet strangely deep fiction (the purple prose has the power of rich duplicity) will somehow see depth in Andromeda Slate’s romantic torment over whether or not Riley (the super smexy Chthulu monstrosity) reciprocates her feelings. When Andromeda Slate blankly describes her empty lifestyle, devoid of Riley’s reciprocated feelings, the tumult of her sadness plucks at our feeble heart strings, as though our heart strings could be plucked to play sophisticated piano concertos. Be on the lookout for the insider’s look at Serra’s backstory on how her dream transfigured her life, and took her out of the doldrums of her “stay at home” mother lifestyle. Here at “A Bibliophile’s Reverie,” we are the place that will help bring Serra the needed attention that she deserves! !